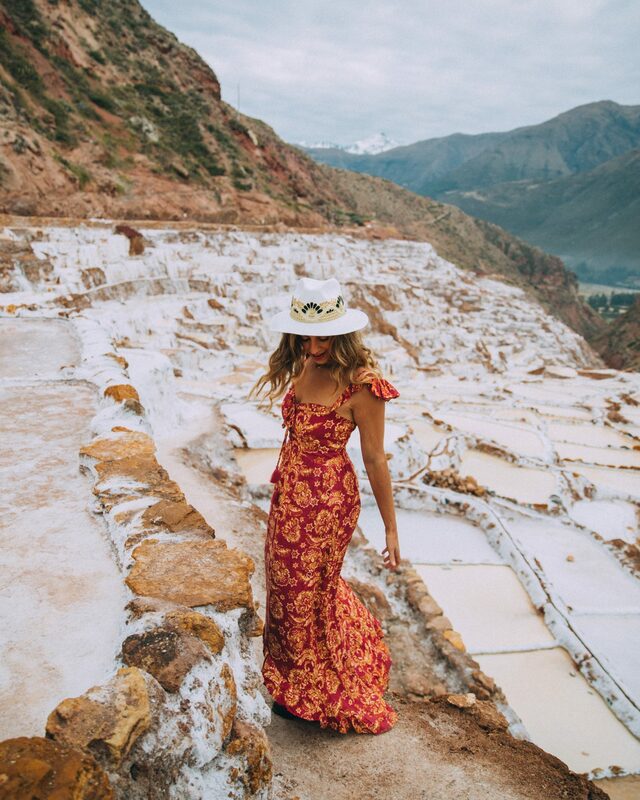 I know a lot of you have been asking, finally my Ultimate guide to Peru is here!! This post is filled with tons of info and some of my favorite pictures ever! 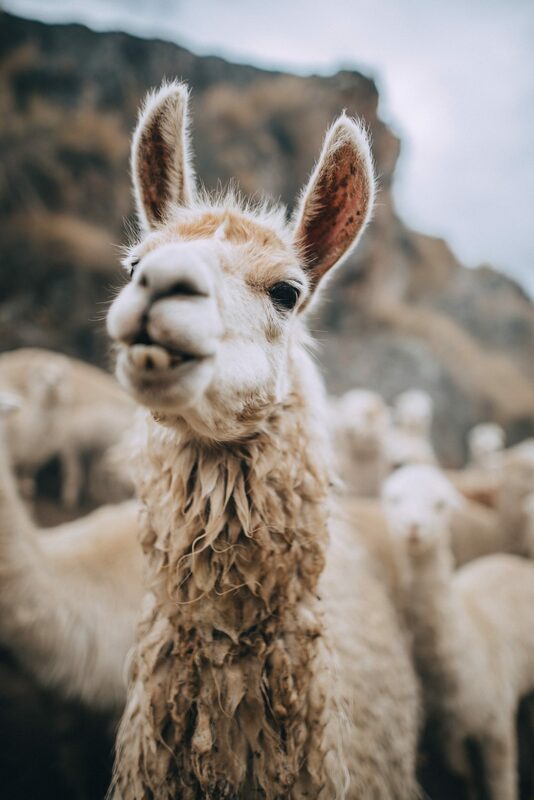 So if you’re planning or dreaming of a trip to Peru, keep reading I’m giving you the complete 4-1-1! 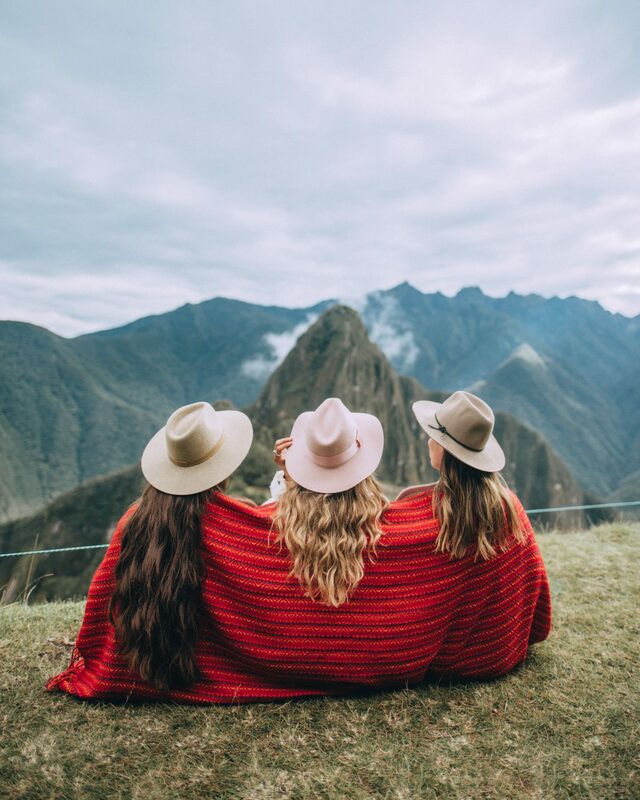 I had been wanting to visit South America for as long as I can remember so I am sure you can imagine my excitement when I was asked if I wanted to add a 7-day girls trip to Peru to my summer travel schedule. My response was a squeal sounding somewhat like YESSSS!!! The trip was a whirlwind, jam-packed with adventure, amazing people, and unique experiences. Combined with the high altitudes of Cusco and Machu Picchu, it felt like we were on cloud nine the entire week! Our itinerary was organized by our host, Acanela Expeditions. It was jam-packed but I wouldn’t have had it any other way. The only thing I would have changed was my departure date. The trip flew by way too quickly and there is so much more to still see, I can’t wait to revisit. Now being home reflecting on it I can see why so many people told me Peru was one of their favorite countries. 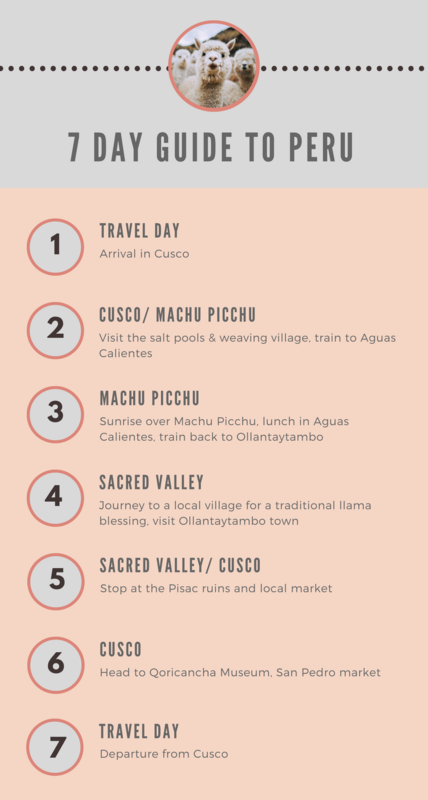 That’s why I decided to create a detailed post outlining The Ultimate Guide to Peru, based on my itinerary. See our day to day guide at the bottom of this post, but don’t skip ahead or you’ll miss my favorite experiences! Once the capital of the Inca Empire, Cusco sits about 11,152 feet (3,399m) above sea level. Prior to our departure we had gotten several warnings about altitude sickness and were a little nervous about how we’d feel once we landed. Thankfully none of us experienced major side effects, mainly just shortness of breath and slightly lower energy levels. We were told one of the best ways to help fight altitude sickness is Coca, I loved drinking the tea but you can also get chewable candies or by chewing on the tea leaf itself. We landed in Cusco early morning only to find out that our bags hadn’t arrived. We were supposed to pick them up in Lima but we had no idea as our bag tags said they would be sent straight to our final destination. We made our way to our hotel, Casa Adina without our bags while our amazing hosts worked their magic at getting our bags to us. Later that evening we got a call that our bags had finally arrived, which the airline said was impossible. Huge shoutout to the Acanela team! We were so excited because we could finally change out of our travel clothes and into something warmer. Just in time for our group welcome dinner. **Note: If traveling through Lima let this be a reminder, as our guide said it happens very often that the airline doesn’t know that you have to collect them during your connection through LIM. Now before we get any deeper, I need to first introduce you to the squad! I was already so excited about this girls trip to Peru and even more so when I found out who I’d be spending my time with. These are women who have been inspiring me on Instagram since I started 2 years ago; we had communicated through messages but never actually met. It’s amazing how Instagram can connect people and create so many virtual friendships. And I can’t forget about the boys behind the scenes, Mitch and Jake who helped capture every moment! The next morning we all packed into the van and drove along the Andrean landscape on our way to Salineras de Maras (the famous salt pools). When we arrived I think we all stood frozen in awe for a moment of view in front of us. After we were done taking way too many photos (as we always do), we made our way to a private lunch at Mama Mary’s. Full disclosure, I was a little concerned coming to Peru being a vegan, as I always heard of Peruvian dishes containing meat. However, I was blown away by how accommodating the local restaurants were to make something work. I ate a lot of quinoa soup, avocados, and Andean corn. I wasn’t complaining, it was so yummy! After lunch, we visited a local weaving village where we invited to sip tea and learned a little about their weaving traditions and processes. The village women explained to us that each piece was handmade by a member of their family and how each weaving pattern and color means something different. I was so impressed with the quality and process, I just had to pick up a sweater, blanket, and scarf. At the end of the day we jumped on a 2-hour picturesque train ride to Aguas Calientes where we checked into our next hotel. The train ride is absolutely beautiful passing flowing rivers through the mountains before arriving at the base of Machu Picchu. Visiting Machu Picchu was a lot more of a challenge than I thought. If you want to get to the summit for sunrise, here is what you need to do. All this will allow you to witness sunrise at the summit at 6:30 am. We found out that in order to get to the summit for sunrise you need to be on one of the first 4 buses up the mountain, hence why we were up and in line so early. And if your plan is to see a sunrise over the ruins of the big mountain you’ll want to take note of few things. 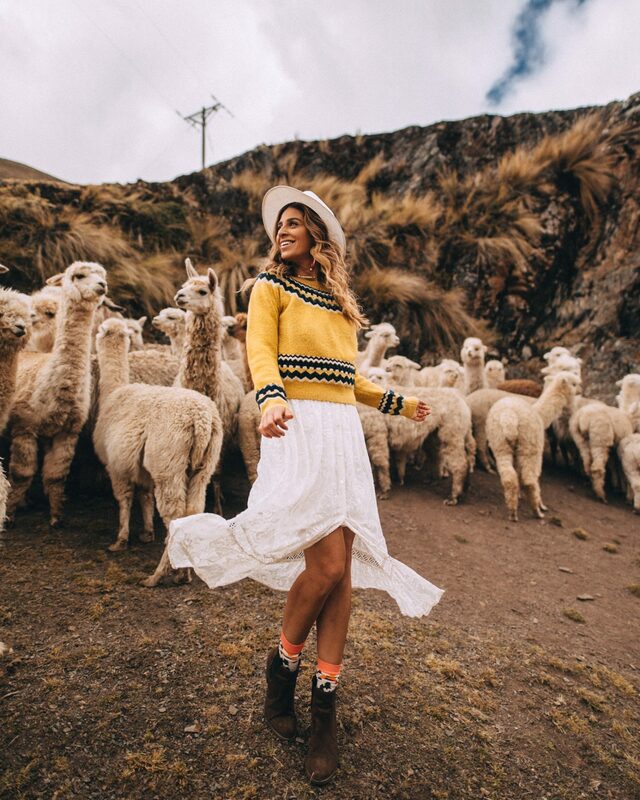 Dress warm – The early mornings in Peru can be quite chilly, especially when you’re waiting in line at dusk. But once the sun rises on top of the mountain it can heat up quickly so be sure to dress in layers. Limit your drinking – Once you go through the gates to Machu Picchu there are no bathrooms. A lot of people make this mistake thinking you can go to the bathroom and then go back in. Unfortunately no, once you enter you cannot exit until you’re ready to leave, so be forewarned and pee right before you’re about to go in. Don’t rush through – Machu Picchu operates one way. Meaning, don’t rush to get down to the ruins because once you go down you cannot come back up to the viewpoint. We saw someone make that mistake and they were so upset they couldn’t go back so take your time and get all your pictures while you’re up there. Machu Picchu is significantly lower than Cusco at 7,972 ft (2,430 m), but that doesn’t mean that you won’t feel the altitude. A 10 min walk uphill felt much more grueling than we anticipated. We finished our time in Aguas Calientes with lunch at a local restaurant before getting back on the train. Our next stop, Ollantaytambo. 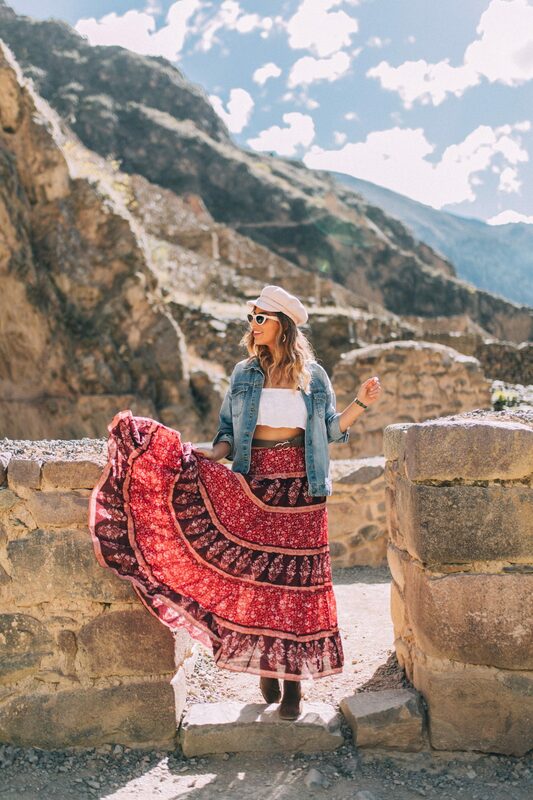 Ollantaytambo is a charming village in the Sacred Valley, where locals still live in homes built over 500 years ago. We had some free time that afternoon so the group split up. Most of the girls decided to go into the town and visit the little shops and markets but Mel and I fell in love with the old charm of our hotel, Hotel Pakaritampu. 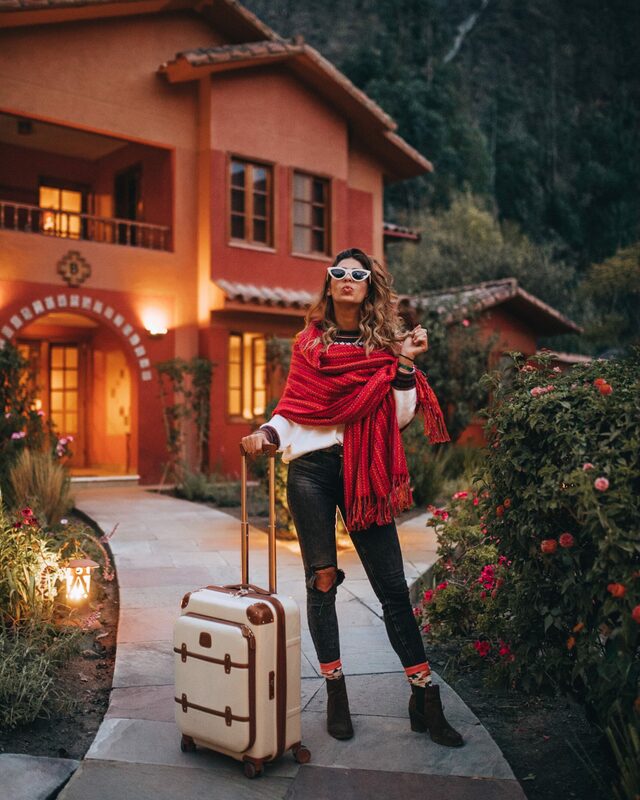 We decided to relax, take a few photos around the property and get cozy by the fire. My checking Machu Picchu off my bucketlist face! Pure bliss! The next morning we traveled about an hour by car through the mountains to the Latis Valley, the highest altitude we experienced the entire trip at 17,000 feet. Once arrived we were introduced to some locals who welcomed us by allowing us to participate in a ceremonial llama blessing. We had no idea what to expect out of this experience but it ended up being the highlight of our trip! I know what you’re thinking, over Machu Picchu?!! And surprisingly yes! Machu Picchu was great but it’s full of people, this was a completely private and unique experience which tourists are not usually invited to partake in. These blessings only happen twice a year when new llamas are born into the herd. Their belief is that it brings good luck and health to their animals. The families gather dozens of alpacas together for the blessing, my favorite part had to be witnessing a llama wedding (yes that really happens here!) 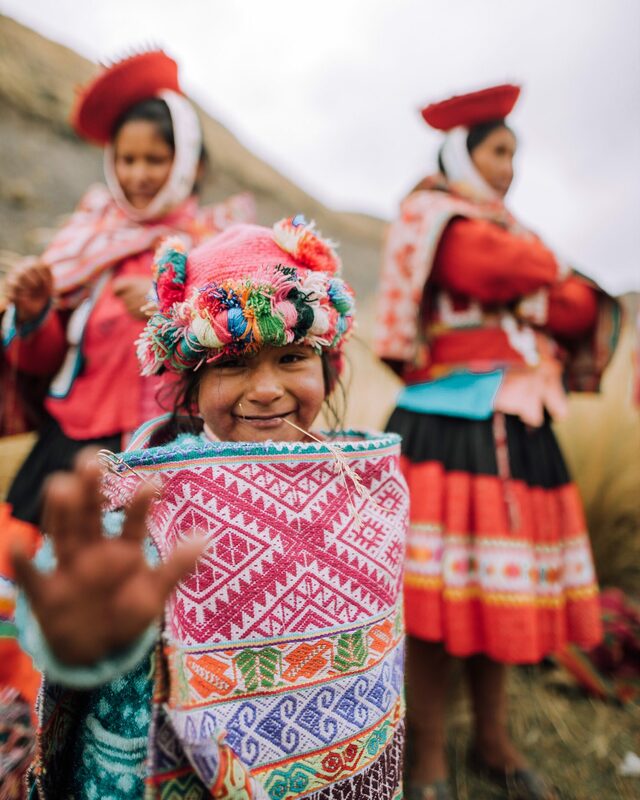 At the end of the ceremony, the villagers danced around in traditional colorful clothing as we released the llamas back into the mountains. One really interesting thing I learned was each community has different embroidery and patterns which you can recognize them by. It’s interesting because you can tell where they come from simply by the colors in their hat. The next day we checked out of our hotel and made our way to Pisac before checking back into our Cusco accommodations. Pisac is famous for it’s Inca history and incredible textile market. The market was a bohemian heaven! They weren’t lying when they told me it was the Peruvian version of Morocco! Each row was filled with more color, texture and handmade souvenirs then the next. I came away with a rug, 2 pillowcases, a hat, and another scarf. By this point, my luggage is quickly filling up! 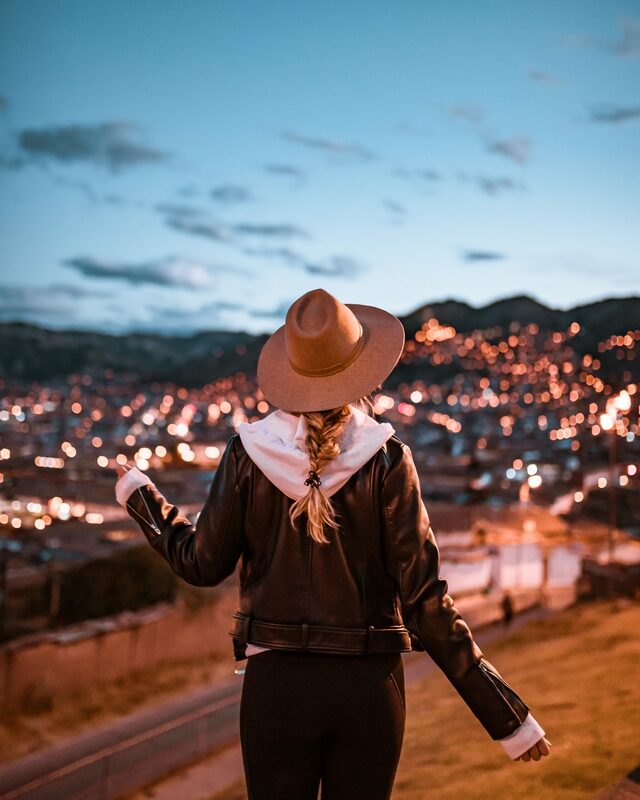 The town of Cusco is filled with character. 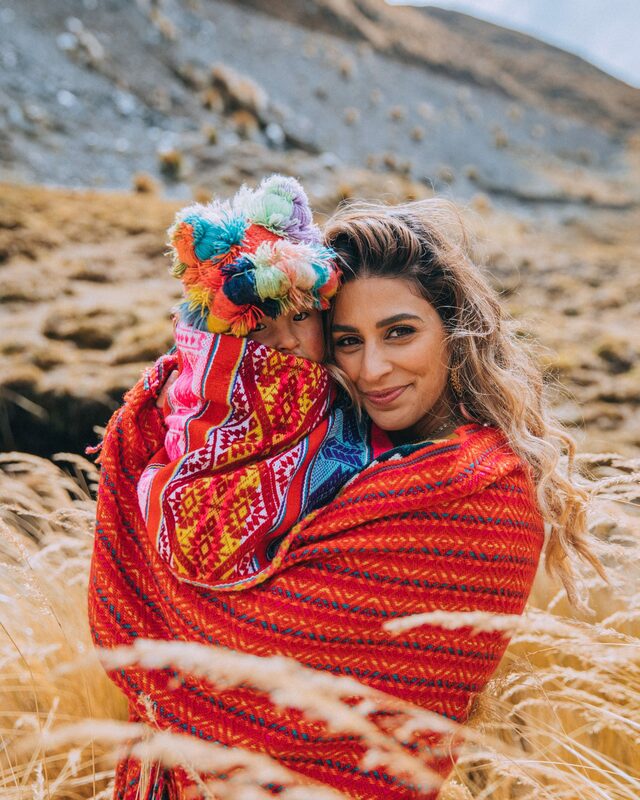 Walking along the cobblestone streets we came across so much beautiful architecture, tons of colorful shops, and women dressed in traditional Peruvian clothing with baby llamas on leash, a popular tourist photo opp. 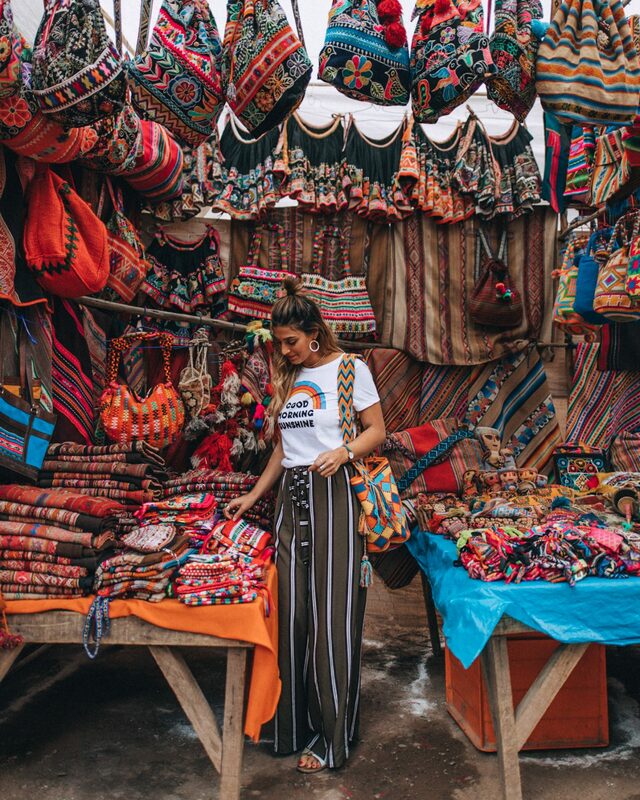 On our last morning in Peru we spent most of our time at the San Pedro Market picking up a few last minute gifts (yes more shopping)! The market reminded me of the markets in Southeast Asia where the locals go to eat for dirt cheap and pick up fresh produce all under one roof. I fell so in love with a sweater I saw for James that I went to every stall in the market trying to find the same sweater in the right size. I ended up snagging a few extra goodies in the market like a Christmas ornament, and some snacks for the flight. This trip was filled with so many one of a kind experiences and personal bucket list crushing for me! First time in South America, first time in Peru and finally getting to experience Machu Picchu! I have to give a huge thanks to Acanela Expeditions for inviting me on this once in a lifetime opportunity with the best crew I could have asked for! 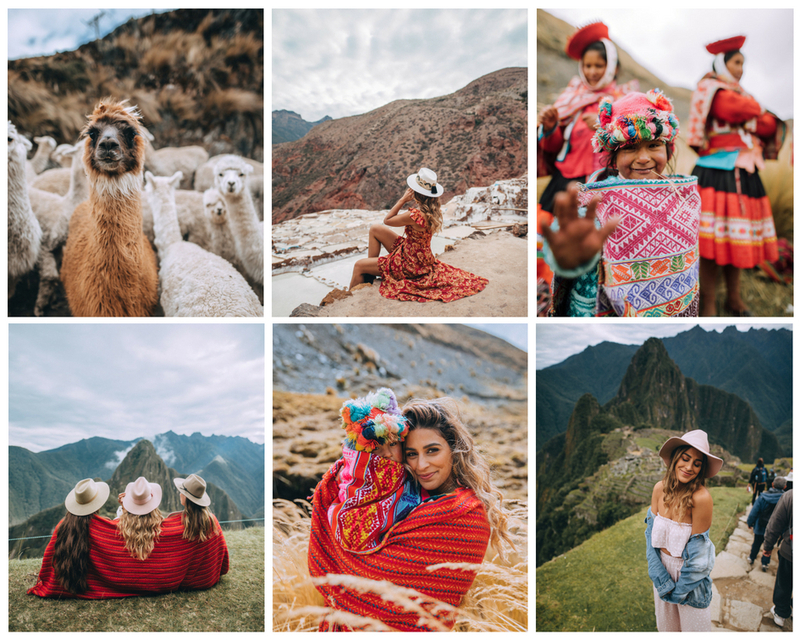 Keep scrolling for more photos and our day to day guide for 7 days in Peru! 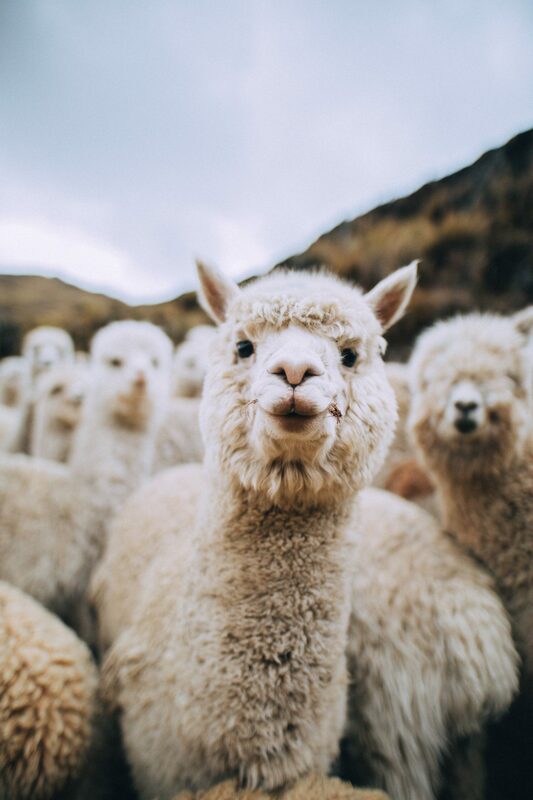 I love all of the llama photos! Machu Picchu seems like it has changed some rules. When we went back in July 2015, you could come in and leave and come back on the same day. You could also go anywhere inside at any time except the hikes up the two mountains. Some of the areas closed down a little early, but otherwise you could go in any order. It’s still an amazing place, and I’m so glad you experienced it and shared it with us. Yes they made some changes recently because the traffic keeps increasing and they want to preserve it as best they can. I’m glad you love the llamas as much as me! I’m so glad they are trying to save it for future generations! This is so so pretty Lisa! This trip looked so lovely and cultural! Thanks so much!! The trip was so amazing I loved it!! 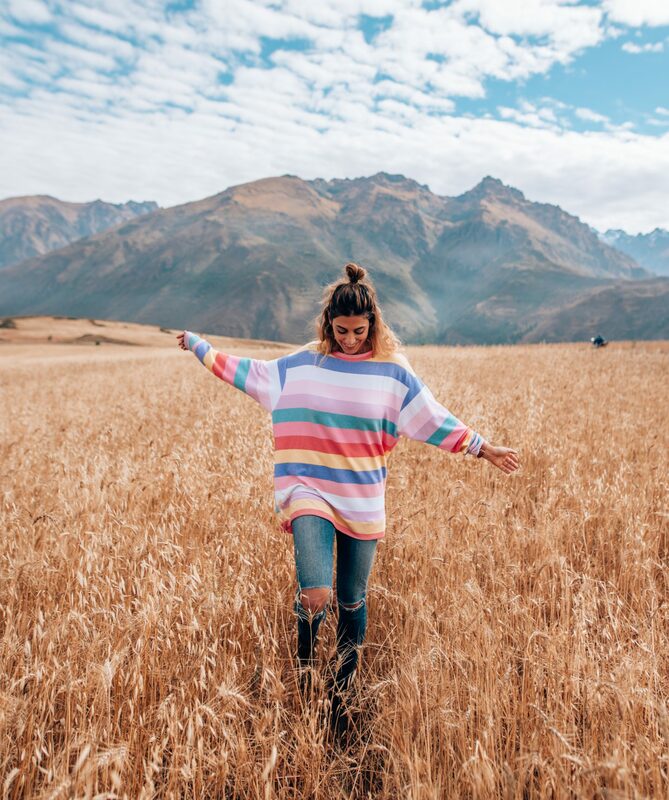 Absolutely love your trip experience to Peru. Your trip sounded amaizing and I can only image how much you loved Peru. Wow I can’t believe they changed the bathroom rule and that you can’t come back up to the summit once you go down. I was there 2 years ago and those rules were not in place yet. I will pass those details on to some of my friends that are looking to plan their Peru Trip. Loved the post it’s super detailed and very helpful. Yes they made some changes recently because the traffic keeps increasing and they want to preserve it as best they can. Please share the info! Hey sue, I totally understand where you’re coming from. That’s exactly why I said “based on my itinerary”. I didn’t plan the trip unfortunately, if I did we would have visited so many more remote places like the Peruvian Amazonia. I also stated that I am dying to revisit to explore more of the country. What an awesome blog- very easy to read! Loving the vibe you’ve got going. I especially love how you’ve put together a 7 day guide list of the places you’ve explored! I will definitely be wanting to use that in the future! Thank you so much! I’m glad to hear that you’re loving the 7-day guides. It’s nice to know that it’s making it easy for you to plan your trip. Hey Mary, thanks so much!!! I’m so glad to hear that everyone is loving the post. I was worried it was a little too nerdy but it’s exactly what people are asking for. And I’m so glad you love the travel guides! That makes me so happy because I put so much work into them!! epic ! Your pictures are just as beautiful as always !! Thank you so much Emma!! That means so much to me! Thank you so much Emma!!! That makes me so happy! 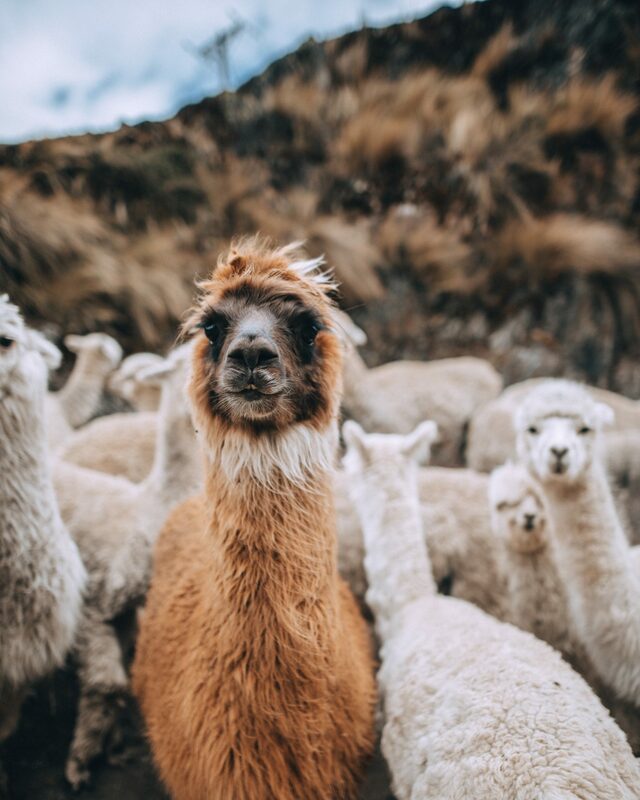 I love love your pictures from Peru. I have been wanting to go there for over 10 years with my best friends and we are finally thinking about checking it off next year. 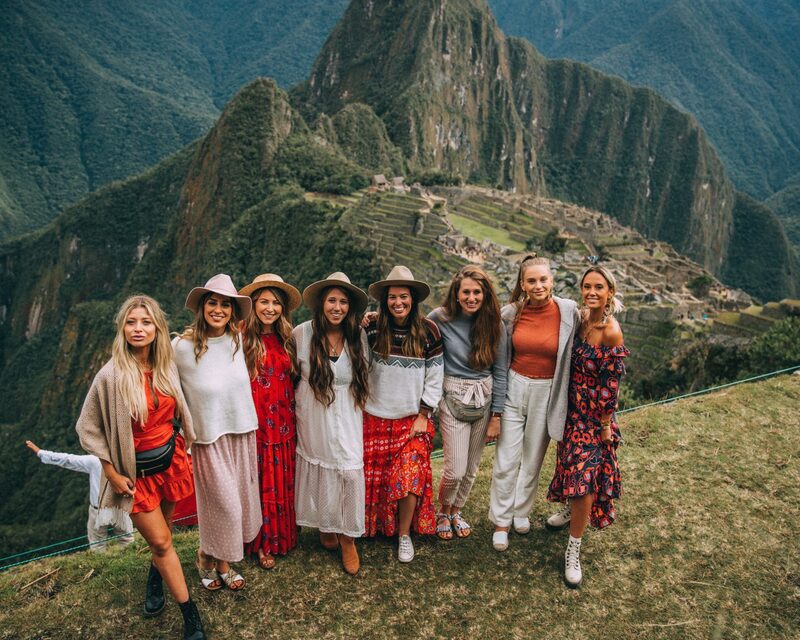 Thanks for always being an inspiration and being showing us the beauty of Peru! Merci tellement!! I’m so thrilled to hear that I’m inspiring you. That means the world. I was there with an organized blogger trip but the company is called Acanela Expeditions. You should definitely check them out because they organize the best trips! I already cannot wait to revisit!